Do you have all the tools you need to do those cutting jobs in the garden? Secateurs are good for small pruning jobs where you can cut stems and branches about the size of your first finger. Generally if it's green it cuts more easily than hardened branches sometimes found lower down on shrubs and hedges. For the harder stems you might need to reach for something bigger. Or are you struggling with some old secateurs and a rusty pair of garden loppers? Don’t know what loppers are? Some long handled pruners use the "cut and hold," method. They're about 3 metres long when extended and have a trigger. Well used garden tool selection. Good for tops of Camellias or getting the fruit of mango and avocado trees. The best tip is to hold the pruning tool that you’re thinking of buying for at least a minute to see if you can stand the weight. This is a good idea because when you’re pruning your garden shrubs, hedges roses or whatever, you’ll be out there for a lot longer than a minute or two. So if you think that long handled lopper is too heavy for you, don’t get the tool. Tamarind Tamarindus indica of the Fabaceae family. 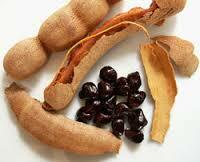 Tamarind is native to Africa but grows in most of the Asian countries these days. It’s always a bit odd to include a tree in this segment because you don’t think of trees as being a vegetable. Perhaps the fruit of the tree? In this case the pods of the tree are edible as are the leaves. When Arab sea-traders came across the Tamarind tree, they thought the sticky black pulp and seeds of the fruit was just like their native date palm, so they combined their common name for date palm ‘Tamr’, along with the Arabic name for India (‘hindi’), to arrive at the common name tamrhindi on which the scientific name Tamarindus is based. Apparently Tamarind pulp has been traded for thousands of years. Tamarind trees have been growing in North Queensland for many years and some of the older ones have reached enormous size. Did you know that Tamarind trees are indictors of long contact between Indigenous and Macassan traders? How we know this is because Tamarind trees grow along the Kimberley and Arnhem Land coast are hundreds of years old and have survived through cyclones and fires. Their positions indicate the location of Macassan trading camps that were set up on the coast many hundreds of years ago. The Macassans sailed from the island of Macassar in the eighteenth century, which today is known as Sulawesi, Indonesia. Tamarind tree in Brisbane Botanic Gardens. Tamarind fruit is a legume with a fleshy edible pulp inside and is mainly used in cooking. But for the long distance sailors it was also a handy source of vitamin C.
In the same way Europeans carried citrus to ward off scurvy, the Macassans used tamarind. It looks nice, with ferny foliage that almost look like acacia leaves. The red and yellow flowers are very attractive pea shaped flowers that almost look like mini orchids and although each flowers is only 2 ½ cms wide, they hang together in a bunch, scientifically a raceme so they look all the more spectacular. The tree itself has weeping branches that give plenty of shade. 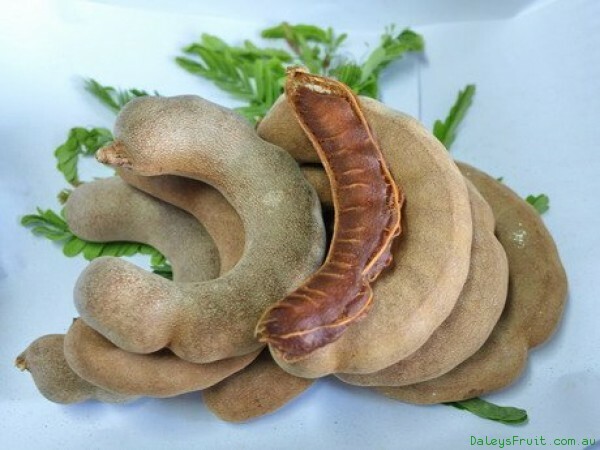 Tamarind pods are slightly curved, 10 to 15 cm long and have a brown colour. 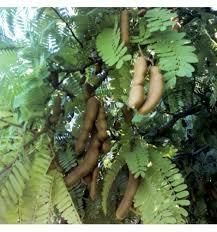 There are, 4 to 12 seeds in each pod but the rest of the pod is made up of yellowish or brown coloured pulp that tastes very sweet and sour but pleasant .﻿﻿Tamarind trees are very slow growing so you won’t have to worry about it reaching 20 metres any time soon. 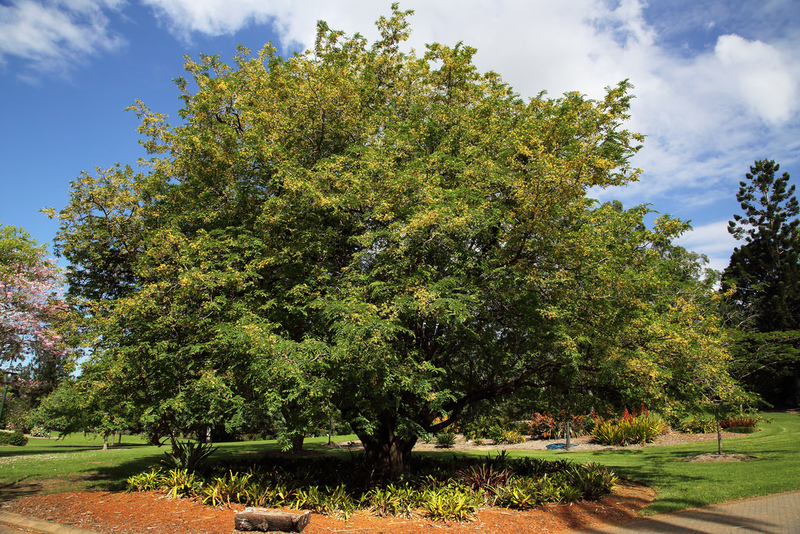 Tamarind prefers a tropical and subtropical, dry and windy climate. It can adapt even to a warm temperate climate, but there they won’t be very productive. Young plants won’t cope with cold winters, but the mature or adults plant is develops a greater cold tolerance to temperatures as low as -20 Celsius. Having said that, Tamarind will recover from frosts if protected when young. The best planting position is in full sun. For flowering, fruit setting and fruit development, tamarind trees need clear sky and drier days in other words a dry season to grow well and has great drought resistance so it’s ideal for semi-arid regions as long as you give it some extra watering. Tropical conditions are preferred of course but you know gardeners like a challenge and this tree makes a lovely shade tree. It tolerates most soils, as long as they are free draining. The pods are harvested when mature, that is, when they turn a cinnamon-brown. In many tropical countries they have been an important item of export, thanks to their long shelf life. There they strip the pulp from the shell and press into large cakes, seeds and all. These are then packed for shipment on sacks made from palm leaves. The seeds of the Tamarind retain viability many months when kept dry if you want to propagate them. So how else can you use Tamarind? You can peel off the brittle shell to eat the pulp raw. Or you could make a tamarind drink. Make it like a cup of tea, sweetened to taste, refrigerate. Better than cordial some say. The leaves, flowers and immature pods are eaten as vegetables. The ripened fruit is used in desserts, as a jam, blended into juices, or sweetened drinks, sorbets, ice creams and other snacks. In Western cuisine, it is found in Worcestershire sauce..
Tamarind has large amounts of Vitamin C of course.Tamarind pulp also contains 70% carbohydrate, 3% protein and less than 1% fat, it also contains tartaric acid (8-10%), which occurs in other fruits like bananas and grapes. Impact Damage on Plants part 2. This garden series with Garden Designer Peter Nixon, is all about garden challenges thrown at us mostly by nature but also due to a situation in your garden that you might need to fix. So far we’ve been covering hail damage, but will also cover sun scorch, garden loopers, and a few other odds and sods that aren’t necessarily damage but a garden challenge all the same. Today’s garden challenge is about foliage dependent damage mainly from hail, but we’re delving more into what you should do with different plants that have been affected. I'm talking with Peter Nixon, garden designer. Lots of tips there for Bromeliad, tropical and rainforest gardens. Don't reach for the secateurs on your Bromeliads that have been split longitudinally. Leave your plant for a week or two, because the plant may be able to re-direct the starch from the damaged leaves to the growing point, and you'll be depriving the plant from resources to come back with. If the terminals are intact on your Kalanchoe, you can cut back to just above the bud and it will re-flush. It may take a year to recover, but it will recover. For dented type of damage on succulents such as Crassula, cut that away too. It’s not just the leaves that get affected by the damage, but take a closer look at the stems, branches and trunk of your trees and shrubs to see if they’ve been hit as well. I remember hiding amongst the large Dahlia bushes as a little girl. There seemed to be only a few colours that my father could get, we lived in a small country town in South Australia, and the Dahlias were a dark crimson purple to light pink. As long as we lived in that house he would replant them in the same spot, near the front fence every year. The rest of the garden had mostly vegetables and fruit trees. Would you like to grow a small bush that’s just like a bunch of flowers? Known as the “queen of the autumn garden’ the old fashioned Dahlia varieties of this plant grew into quite a large bush that needed staking. Dahlia plants range in height from as low as 30cm tall as 2-3 metes. The flowers can be as small as 5cm or up to a 30cm in diameter. There are literally thousands of cultivated varieties of Dahlias which have been hybridized throughout the years. You can leave your Dahlia tubers in the ground in warmer areas.The black leaf variety "Dahlia Summer Days" are not as susceptible to powdery mildew and spider mite, plus only growing to 30cm in height they don't need staking. It may surprise you to learn that the Dahlia flower is the national flower of Mexico, most likely because it native to the country. When given as a gift, the dahlia flower expresses sentiments of dignity and elegance. Dahlias are also a symbol of commitment and bond that lasts forever. ﻿Maybe not so much today, but the dahlia flower was used in gardens and flower arrangements to celebrate love and marriage. Join the weekly garden conversation. 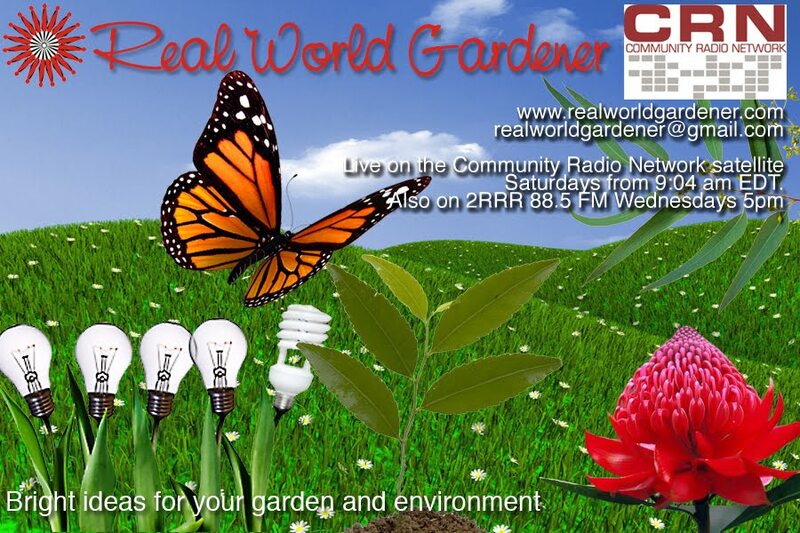 All Posts are Copyright of Marianne Cannon, presenter of Real World Gardener, 2009. Picture Window theme. Theme images by Josh Peterson. Powered by Blogger.